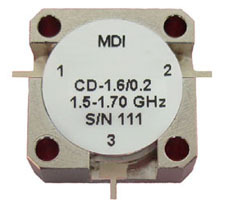 Microwave Devices offers a wide range of drop-in circulators, designed specifically for use with stripline and microstrip circuits. Many of our standard models are shown in the tables below. Custom units can also be provided. Note: Unit isolation is equal to the match on port 3. Example: If port 3 return loss = 20 dB, then isolation = 20 dB.